Mr Worley took off his red hat and red shirt but said: "I look this way 24/7, 365 days a year. This is me." Officials at Disney World's Epcot park said they had had complaints from "several guests who were very upset". 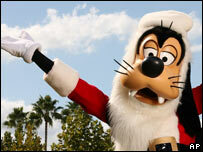 Disney said it had its own Santa at Epcot and Mr Worley was "confusing" the children. Mr Worley said he had played a jolly elf at charity events for a number of years, while his wife sometimes dressed up as Mrs Claus. Mr Worley said he still loved Disney and Christmas.